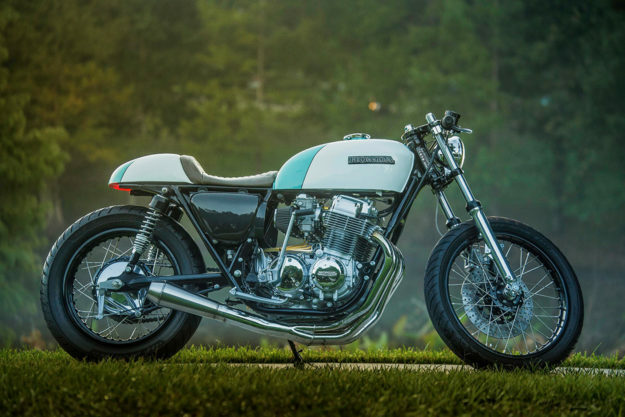 Whenever we question the popularity of classic Honda fours, someone builds a CB that reminds us just how damn charming they can be. Today, that honor goes to Justin Webster of Gainesville, Florida. 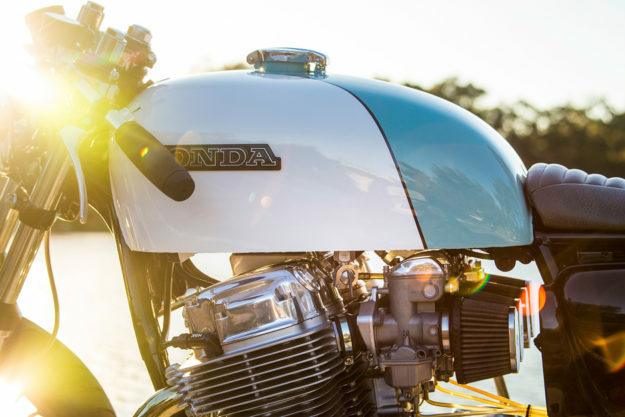 Justin runs J. Webster Designs—an up-and-coming company designing and manufacturing parts for vintage Hondas (and others). When he’s not focused on that, he’s fabricating one-off items, or tackling full custom builds. 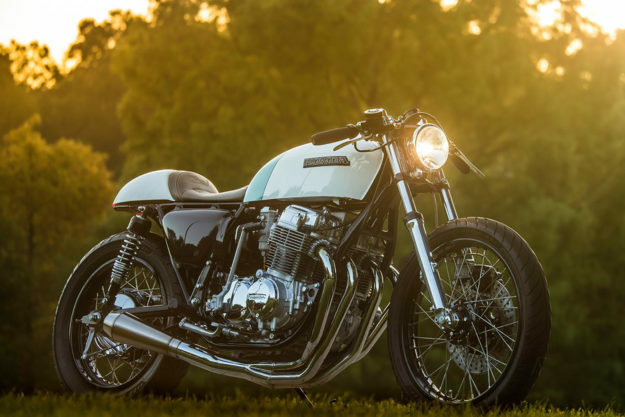 This one’s a 1978 CB750K. 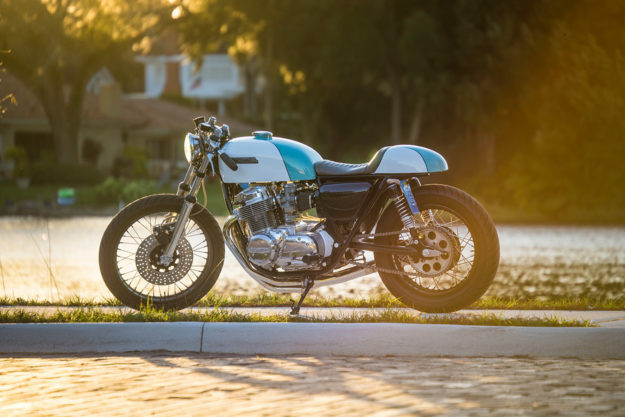 It’s a classic cafe racer built for a gentleman from Orlando who wanted to start riding. 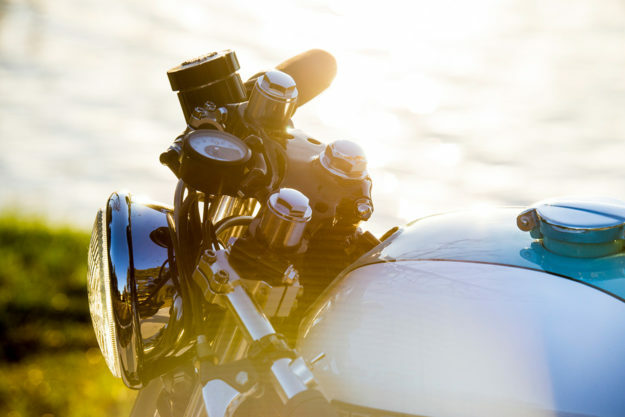 He didn’t have a donor bike—but he knew he wanted something classic, devoid of any overtly modern features. Justin got cracking with a full tear down, before de-tabbing and modding the frame in key areas. Up top is the fuel tank from a 1974 CB750K, matched up to a hand-made seat cowl. Justin’s shaved and smoothed the triple trees to remove any casting marks. And he’s fabbed up a pedestal mount for the lower triple, so that he could ditch the headlight ears and mount a Bates-style headlight. Clip-ons round out the control area, with a single Posh Japan switch to control the turn signals. The high beam, starter and kill switches have all moved to underneath the fuel tank, mounted on custom brackets. In keeping with his client’s request to eschew obvious modern touches, Justin’s updated the electronics as subtly as possible. The bike’s been rewired with some select Motogadget bits—including a new control unit, keyless ignition and classically styled speedo. There’s a Rick’s Motorsport Electrics solid-state regulator and rectifier too, and Justin’s used high-strand, low resistance wiring throughout. He’s also gone to great lengths to hide all the bits keeping the bike street legal—LED taillights are embedded in the rear frame rails, doubling up as turn signals. And, if you look closely, you’ll spot where Justin’s molded the front turn signals into the underside of the fuel tank. The motor hasn’t gone neglected either. 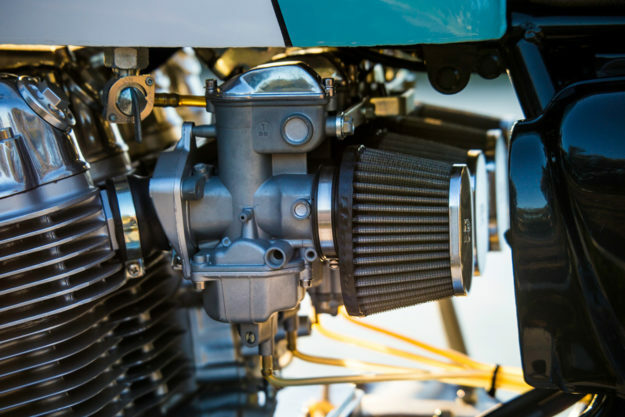 It’s been rebuilt to better-than-new, with fresh internals and hand-polished covers. 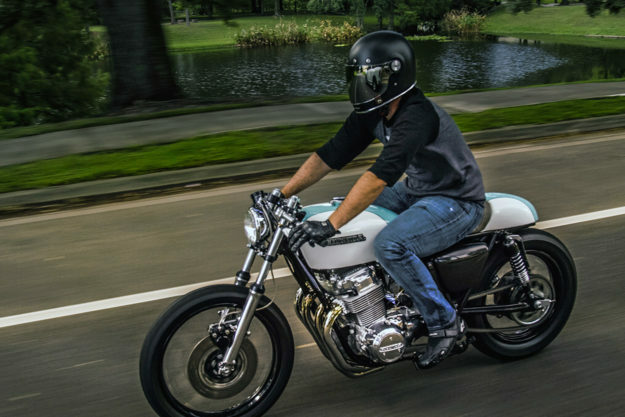 There’s a new four-into-one exhaust system to top it off—with a stainless steel muffler from Cone Engineering. The rest of the bike’s been gone through with a fine toothcomb; Justin has upgraded or replaced anything worn along the way. 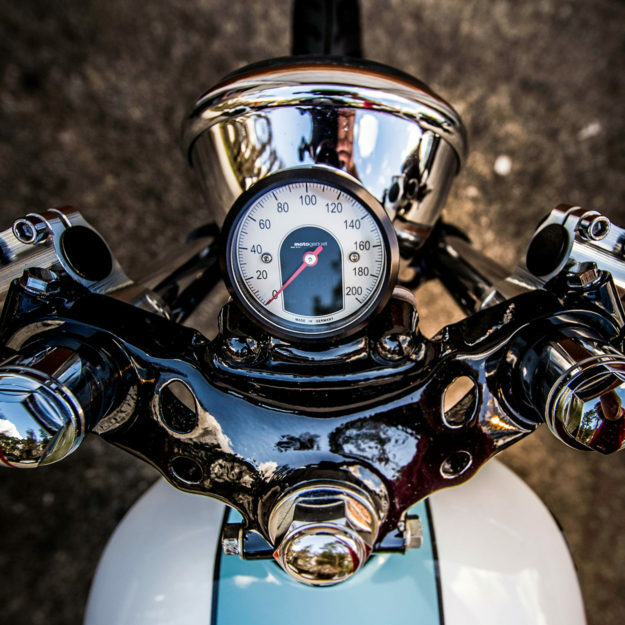 A full complement of goodies from J. Webster Designs rounds out the package: valve tappet covers, an oil pressure gauge adapter, a tach drive plug, and a speedometer drive gear removal mod. The final color scheme takes cues from 1950s appliance design, and there’s fresh upholstery on the seat pad. And the new Avon Roadriders should provide plenty of grip for a beginner rider. 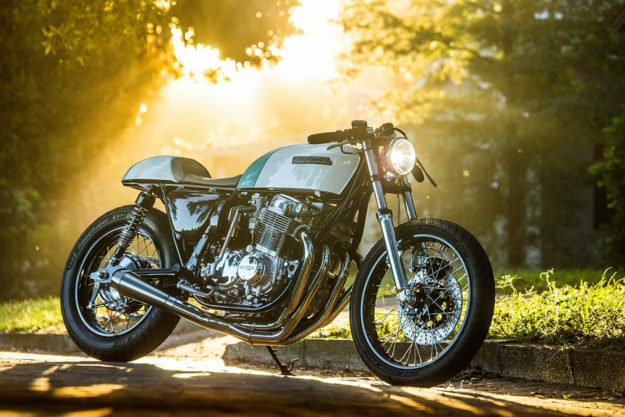 There’s no doubt that Justin’s star is on the rise—he was recently featured on the TV series Wrench Against the Machine, and was invited to the prestigious Handbuilt Motorcycle Show. Now that we’ve seen his work, we understand why.